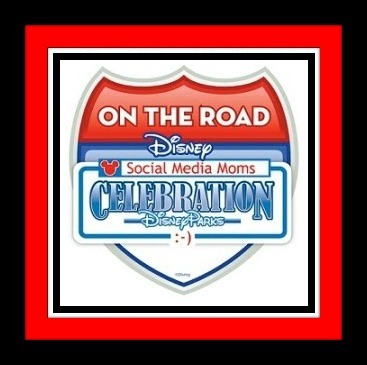 Disney Social Media Moms Celebration “On the Road” at Disneyland Resort! 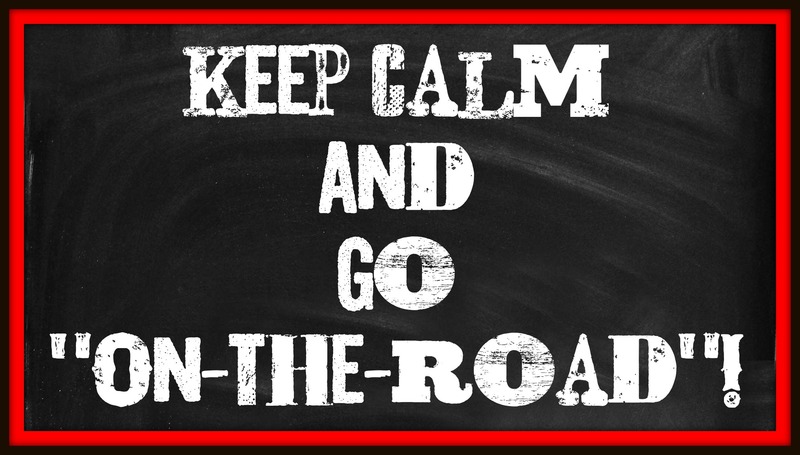 One of the best ways to end Summer is with some pixie dust in your inbox, inviting you to attend Disney’s Social Media Moms Celebration “On the Road”. I just happened to be out doing to some back to school shopping when the invitation arrived and I’m pretty sure I let out the world’s loudest squeal inside of Nordstrom! This “On the Road” event was brought to the Disneyland Resort and held at Paradise Pier Hotel, which is one of the on-property hotels. The day of the event, everything began bright and early. Upon check-in, I received the most adorable bag filled with tons of Disney’s 60th Diamond Celebration merchandise. The tables in the ballroom were also set with a pair of light up ears and a “Paintbrush” for each attendee. When I walked into the ballroom, I was wow-ed by the tables which were all glowing with EARs and “Paintbrushes” at every place setting! I couldn’t wait to use them in the Parks, especially during the “Paint The Night” parade. The centerpieces were adorable too, with the Disney Moms logo. Can you spot anything “hidden”? I enjoyed a delicious breakfast and had the chance to connect with a bunch of other social influencers. It was fun to make some new friends too. I just love to network! After making the rounds to take photos with many of my lovely influencer mom friends, we sat at the tables, anxious to see which special guests we’d be hearing from. Leanne Jakubowski O’Regan, Director of Content Relations for Disney Parks, kicked off the festivities and got everyone very excited about what was to come. In my opinion, she has one of the best jobs in the world AND has the best boss! Disney Springs, formerly known as Downtown Disney at Walt Disney World. This new neighborhood has been completely revamped and includes a ton of restaurants and shops. Erin talked to us about The Disney Parks Blog and what it takes to organize the blog, plan the edoritial calendar and everything else that goes into making this 5 year old site a success around the world. The next portion of the program was something top secret! You know they mean business when they bring in security and you’re told to turn off any and all electronic devices. I don’t know that I’ve ever been involved in something so important! What a treat! Amy Smeed was there to share some behind-the-scenes footage and facts about the upcoming feature film “MOANA” from Walt Disney Animation Studios! Amy Smeed. Photo by Alex Kang. ©2016 Disney. All Rights Reserved. I don’t succeed every day but I try. I try to balance it all but it doesn’t always happen. The final speaker of the morning, Ginger Zee, who is also a “working mom” trying to balance it all. Ginger is the Chief Meteorologist for ABC News and Good Morning America. She also recently starred on “Dancing With the Stars” just 7 weeks after having her 2nd child. She is a strong, confident woman who admitted to knowing that you have to give up on perfection. (even though just looking at her and hearing her speak you’d swear she is perfect) Ginger spoke about giving up on perfection, balancing it all, and learning to focus your time. She said it best when she spoke about “living in the moment” and focusing on what’s in front of you. I also admire her statement about being able to do it all and have a child. I sometimes think there are people in this world who think that mothers can’t do it all. It was such a magical morning of learning, It was a chance to be inspired. It was also an opportunity to connect with others like me. 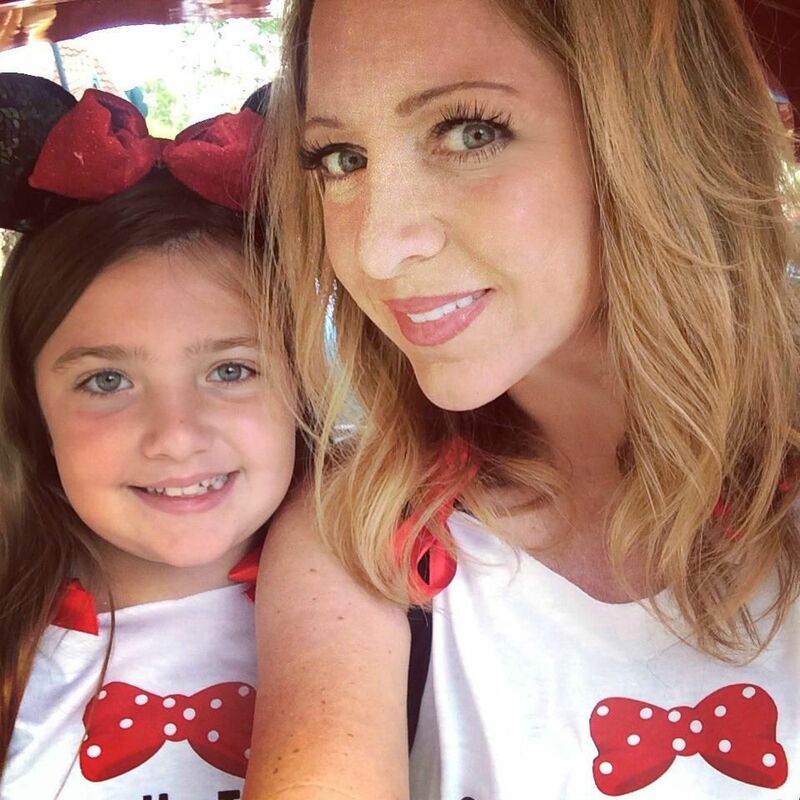 I think most of all, attending Disney Social Media Moms Celebration was an opportunity to take some time for me and to be able to do something that makes me happy….which always involves Disney! It was such an honor to be invited! I was invited as a guest of Disney Parks to attend this conference. I was also provided with admission to enter the Parks afterwards. All opinions are 100% my own. Some images and graphics are property of Disney. 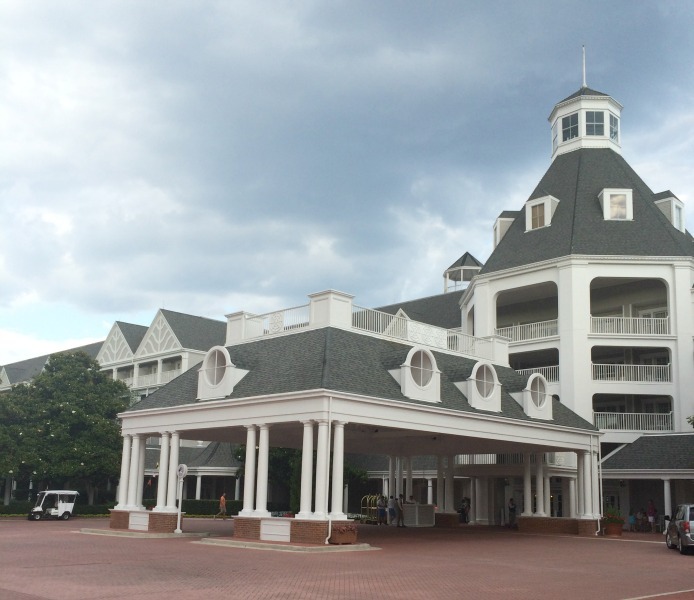 Last spring, we traveled to Walt Disney World, for the Disney Social Media Moms Celebration, and stayed at Disney’s Yacht Club Resort. It was our first time there and we were delighted to enjoy the accommodations at such a wonderful location. The hotel has such a beautiful location on the water and the property boasts nautical decor throughout. 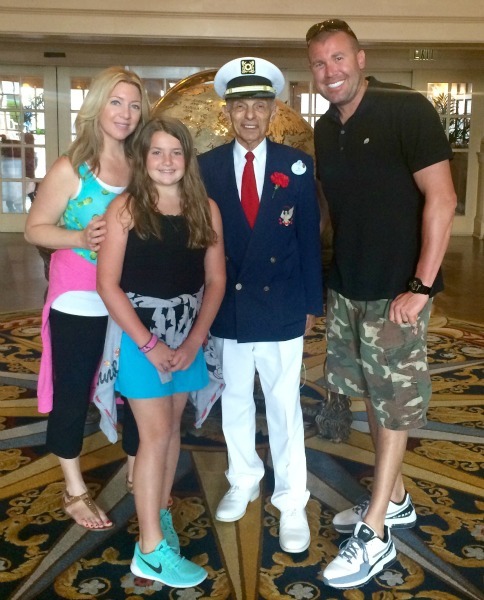 One of the first memories our family made on our visit was when we arrived at Disney’s Yacht Club Resort was when we entered into the hotel’s lobby and were greeted by “Captain Al”. If you’ve been there in recent years, I’ll bet you’ve probably met him too. He’s a very special Cast Member who stands front and center to greet you. Captain Al is one of those people you meet and just know within minutes of talking to them that you want to chat with them more than just a morning “hello”. He wears a very handsome nautical suit and captain’s hat and resembled the nautical Mickey in our hotel room a little bit. 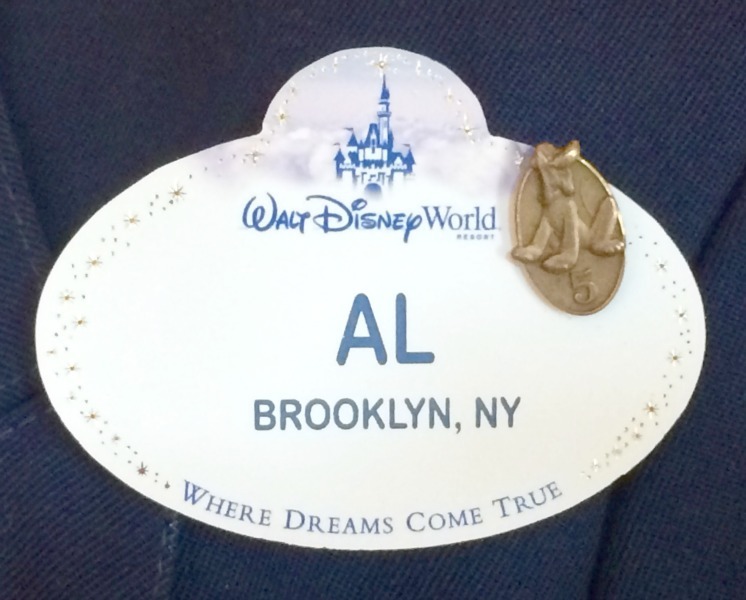 Al’s knowledge about the entire Walt Disney World Resort is amazing. 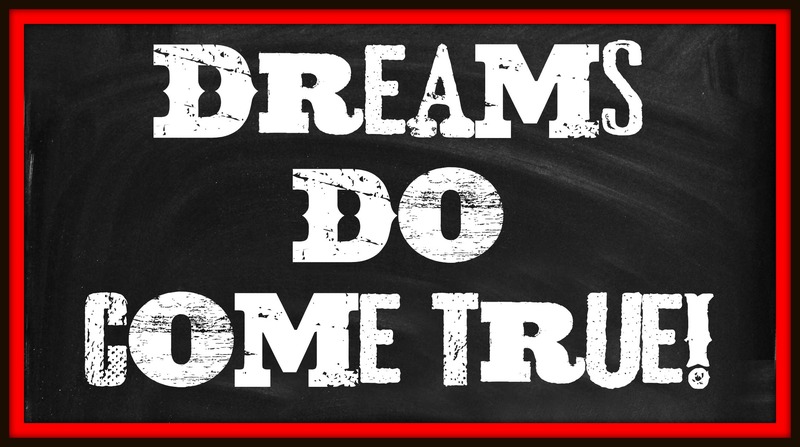 He’ll tell you anything you want to know about it and help you get to where you’re going, What you’ll notice most about him, is that he isn’t in any hurry to get you a quick answer and send you on your way. He would spend all day helping you if that’s what it took. You don’t often find people with that type of work ethic nowadays. Something else I adored about “Captain Al” were his old school values. He told us right off that bat that he didn’t have a cell phone or use a computer. He believes that if people want to see him or talk to him will, they should do it the old-fashioned way…by regular (snail) mail or by actually calling him on the phone to talk. I couldn’t help but cling onto his every word because he reminded me A LOT of my own grandparents, who also held those same values. I’ll totally admit I love technology. I love the convenience of having everything in the palm of my hand (via iphone) , but Al was right when he talked about things getting lost in translation. How often do young people think that older people don’t know what they’re talking about? Here’s a man, not even trying to preach about anything specific, and yet his simple message spoke loud and clear to us. Be present. Be authentic. Unplug whenever possible. Not only did he talk about these things, he lives by his own motto every single day! Can you see why we adore him? When the day arrived and it was time for us to depart from the Disney’s Yacht Club Resort, Captain Al insisted on carrying our bags out for us and refused to take a tip. We were sad to leave but happy to have visited and made such special memories together as a family. We were also happy that we got to meet such a Magical Cast Member such as Captain Al. I just hope we get to return one day and meet up with him again! 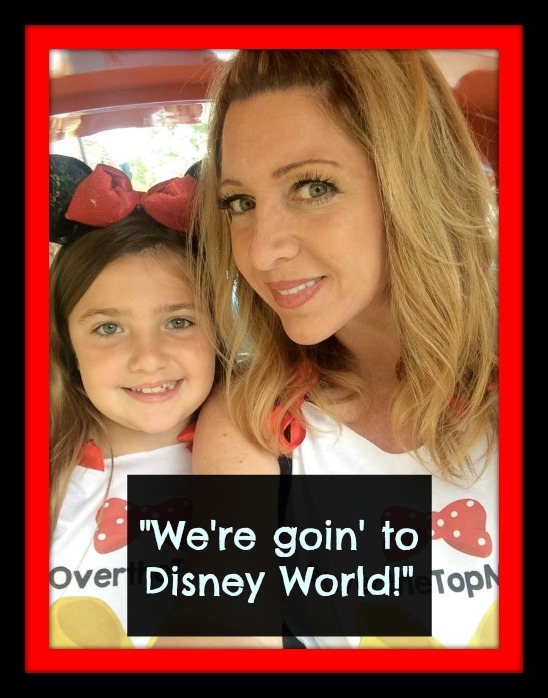 As a mom who loves Disney and shares A LOT about Disney online, it was such an honor for me to receive an invitation to the 2015 Disney Social Media Moms Celebration. I am so grateful for all of the opportunities we (the attendees) received at the celebration, including access to hear amazing speakers like Jeffrey Epstein from D23. 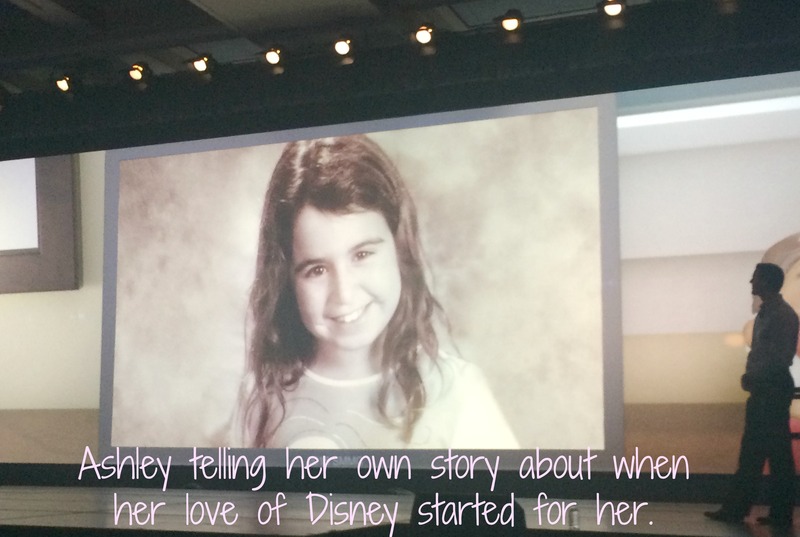 Jeffrey’s presentation at the conference had me teary-eyed (in a good, Disney way, of course) and beyond emotional. 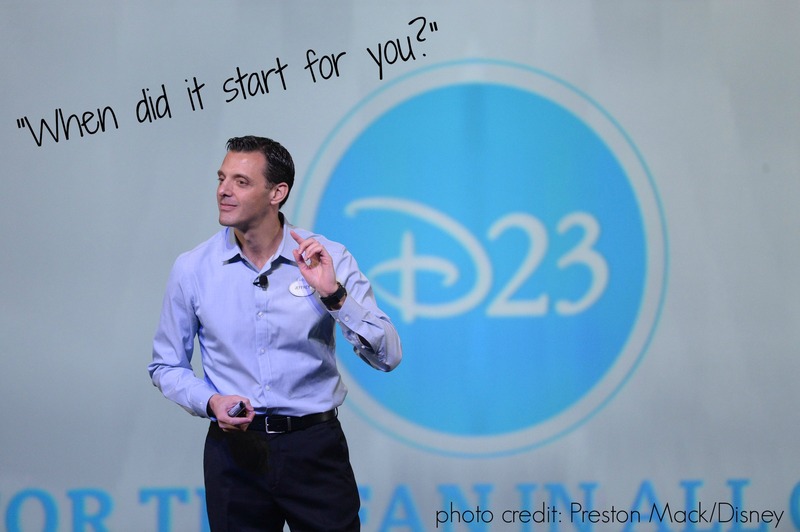 He shared one of D23’s latest campaigns with us called “When Did It Start For You?“. 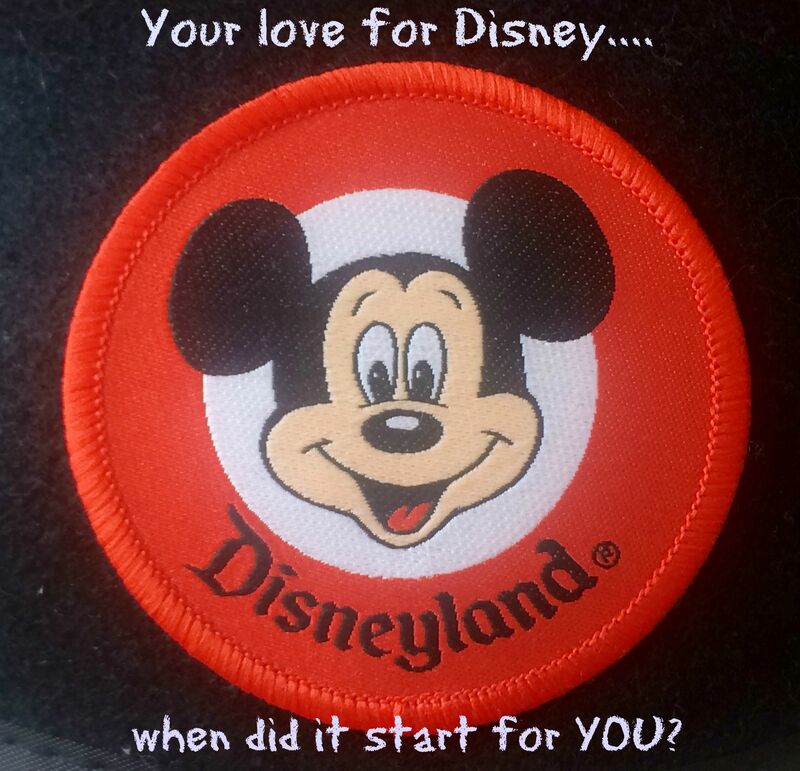 The campaign asks Disney fans to share when they first remember falling in love with Disney and becoming a lifelong fan. It was fun to watch different clips of celebrities, a Disney Legend, some current Imagineers, and even some D23 fans. I couldn’t help but tear up as I watched each video. Listening to these people who all shared a common Disney bond share about their own personal reasons for loving Disney and feeling inspired by Disney was something I could relate to. What inspired me the most though was when I looked up at the screen and realized there was a “When Did It Start For You” clip of someone that I knew up there! She’s mostly an acquaintance I know online, which is how this whole social media thing works, but regardless, to look up and hear Ashley speaking about her own experience was literally speaking straight to my own heart! The picture of her as a young girl was adorable! It really hit home when she proceeded to talk about being bullied and how her love for Disney’s “The Little Mermaid” was her own escape from the ugliness of bullying. The “Ashley” I know online is a fun-loving, adorable Disney girl who posts tons of beautiful Disney photos. I had NO IDEA about all she’d been through and that she’d overcome so much. I admire her immensely for sharing her story on the big screen! I’m trying to remember when it started for me? I can’t remember exactly though. I think I was a baby! I grew up living pretty close to Disneyland. When our family did visit Disneyland (it was a single park back then), it was in the summer and we always had to make the most of one day, from park opening to park closing. It wasn’t like present day where so many people are fortunate enough to have an Annual Pass and can just visit for a couple hours at a time. 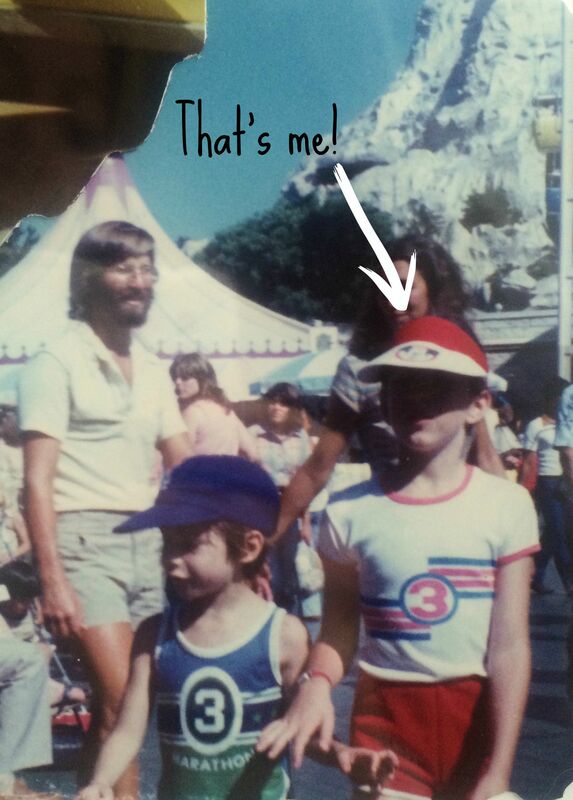 I only have faint memories of my early Disneyland days. I can recall things like The Matterhorn, Mr. Toad’s Wild Ride, and It’s a Small World. 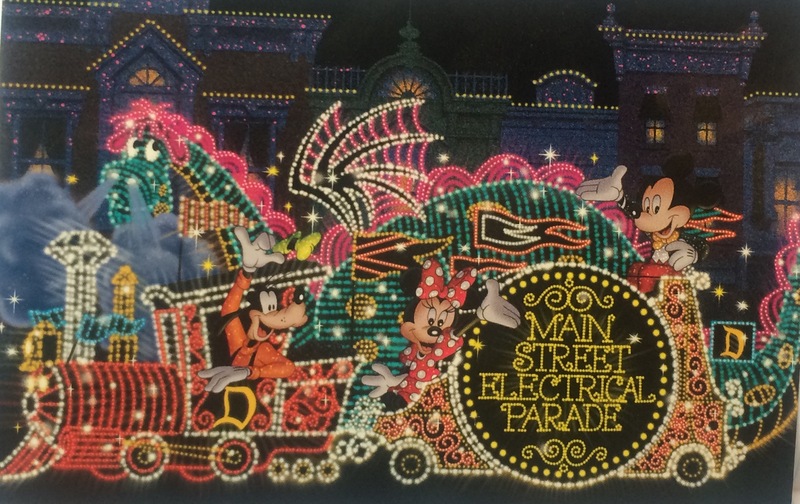 I remember eating lunch at Carnation Gardens and I remember watching the Main Street Electrical Parade at night. Our day at Disneyland was like the one day a year I didn’t fight with my younger brother since we were too busy being in awe of all the magic! What I do remember is that it was all about being with our little family and creating memories together. As I got older, my love for Disney continued to grow and I’d visit Disneyland with my friends (and no parents. One of my high school dreams was to dance in one of the Disneyland parades. I never had the technical training to make it to the final cuts of Disney auditions, but I will say that it was fun to spend hours and hours on the old backlot of Disneyland where they used to hold the auditions. Luckily for me, they created a parade for Disney’s 45th anniversary that guests could actually dance in. It was called “The Parade of the Stars” and guests were picked up along Main Street, U.S.A. in the Omnibus and taken backstage to learn their parts. We got to dance the entire parade route from It’s a Small World to the top of Main Street, U.S.A.! I danced in it on two different occasions, so it was a dream come true…twice! 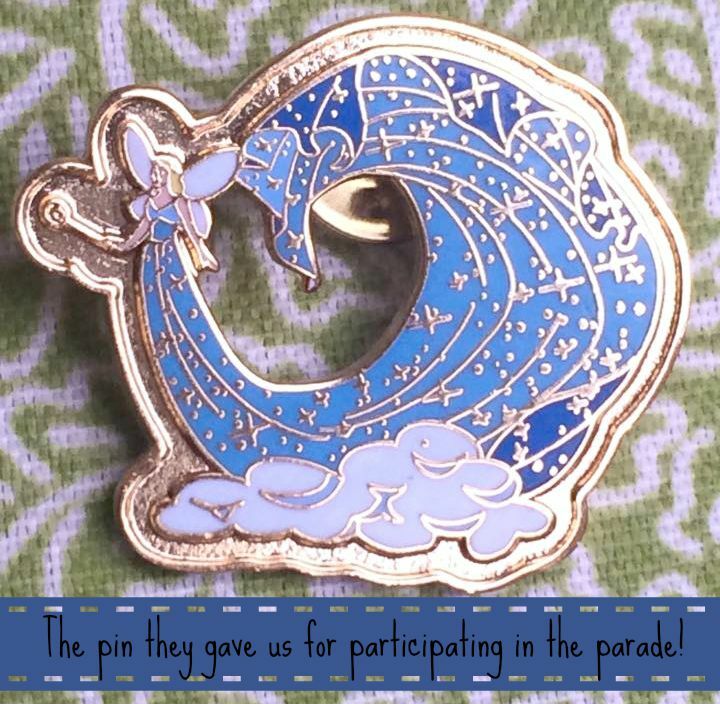 They even gave each of us a commemorative pin for participating. 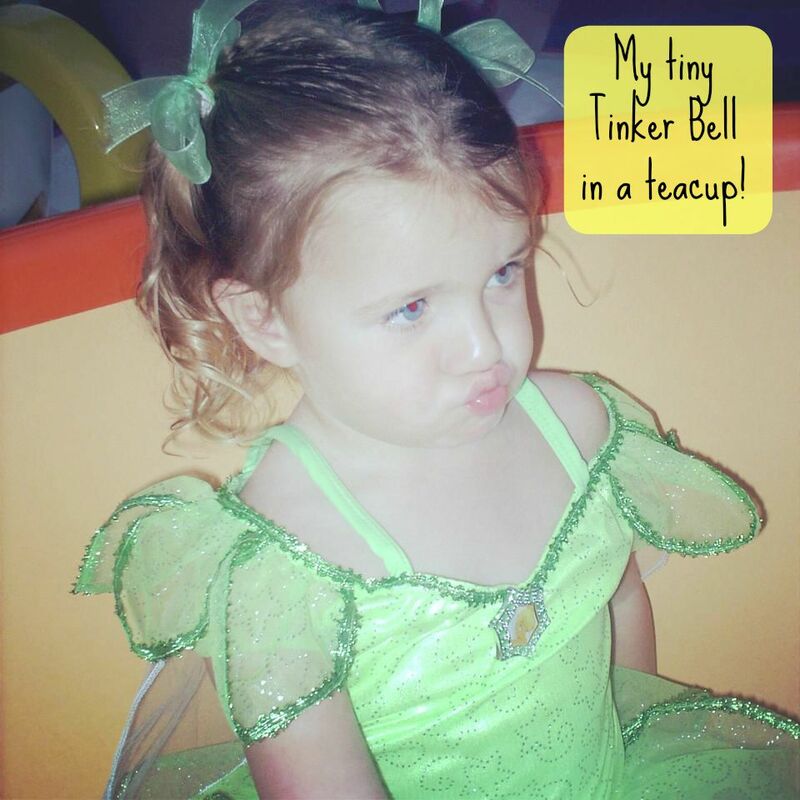 Once I became a mom, my love for Disney was something that I quickly passed on to my own daughter. Her first visit to the parks was at Christmas time when she was just 7 months old. I don’t know how much she remembers about that particular visit, but when she was about a year and a half, she and I started visiting the parks together approximately 2-3 days a week together. My daughter and I watched “The Parade of Dreams” so many times during its run at Disneyland! Now, just hearing the music from that parade brings back all of the fun memories we created together when she was really little. I would say that my love for Disney has come full circle because now I’m here blogging about it too. I could go on typing thousands of words about this topic too, but I think everyone gets the message loud and clear. 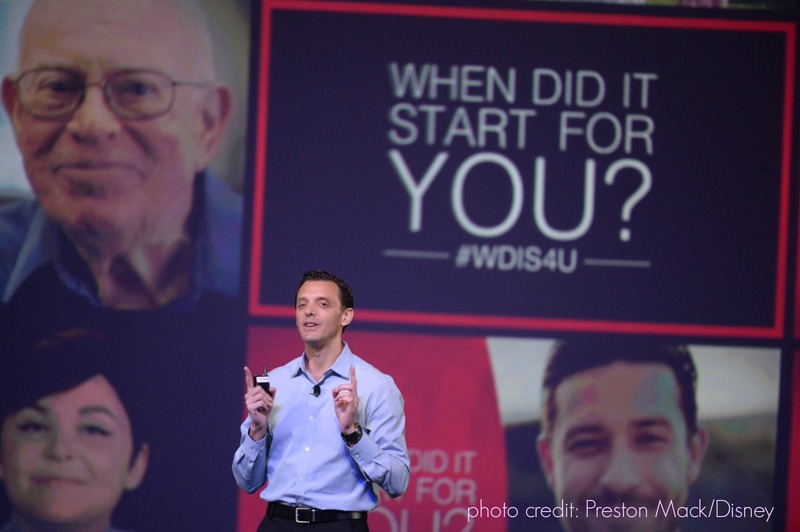 “When Did It Start For You?” is something we can ALL relate to. It’s fun to hear others’ personal stories. Do YOU have a particular memory or reason for when it all started for YOU? Share with me in the comments! 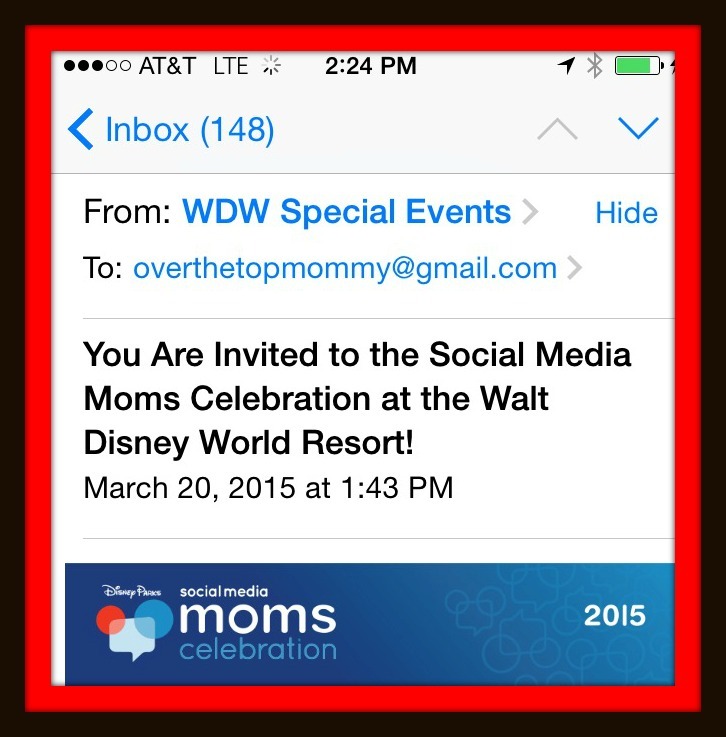 I was so honored to receive my first invitation this year to the 2015 Disney Social Media Moms Celebration! Since I’m a first-timer, I have no idea of what exactly to expect, I just know that it’s going to be magical and I fully intend to take in everything about this once in a lifetime experience! My love for Disney runs deep and I’m very active on social medias in the Disney community, but I wasn’t one of “the invited” last year. Although it was disappointing for me not to be invited last year, I knew that there probably just wasn’t enough pixie dust for everyone to be invited and thought perhaps it just wasn’t my time last year. I want to share a a little bit about my own experience for those are hoping to be invited to the event in the future. I’ve had several people actually ask me what they need to do or how to get invited. I’m only sharing from my own experience and I don’t have “the formula” or “the secret” for how to get invited, but if what I share can help someone else, then I hope it will. Some of the things I’m going to share are actually pretty basic. 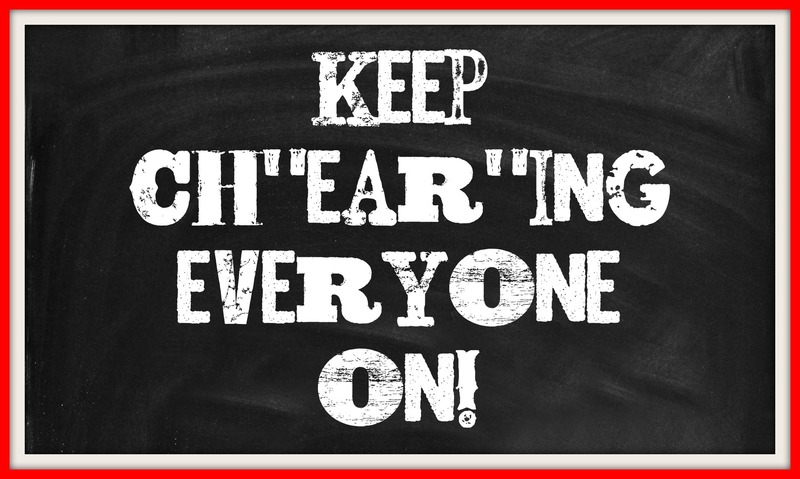 One of the biggest, most important things to do is to support others online in a positive way. Be happy for them! Congratulate them! Comment on their photos, tweets, and Facebook statuses! I can’t tell you to be genuinely happy for others if you’re not, but this is something I do. Honestly, it’s not something you can fake. 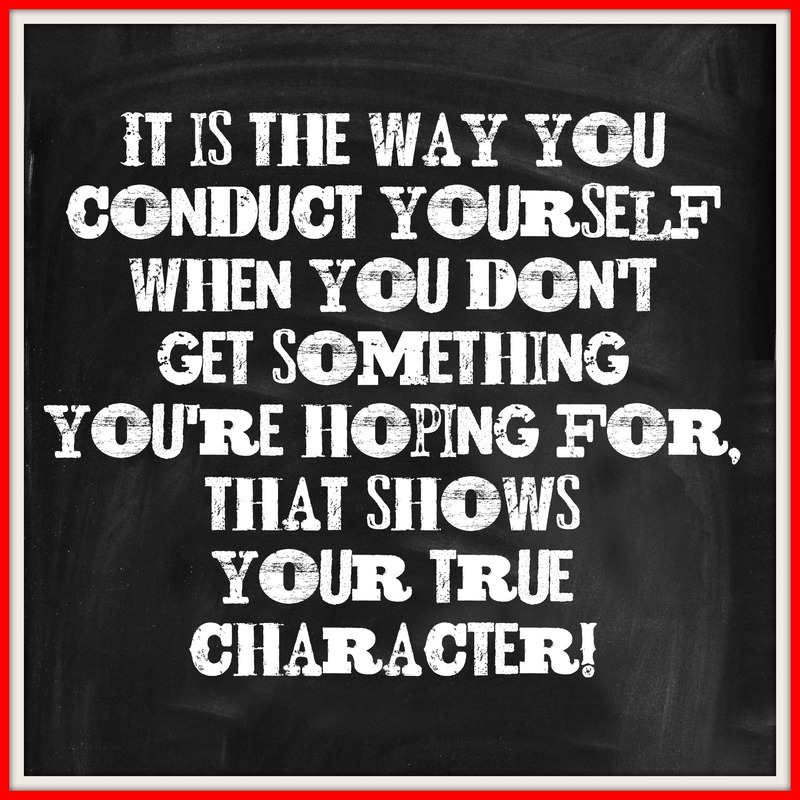 If you have it in your character than do it! Those are the kinds of people that Disney wants at their events anyway. I might also add that it is the way you conduct yourself when you DON’T get something you’re hoping for that will show your true character! 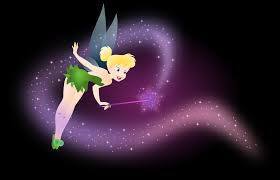 I’ve learned that pixie dust tends to fly in several different waves. What that means for you is that there is still a chance! I have seen initial rounds of invitations sent and then another wave of invitations go out later that night or the next morning. Then, I’ve seen even later rounds of invites go out. Remember, there will be people who will unable to attend, for whatever reason, and sadly will have to decline their invitation. Hold out hope. It can still happen for you. If it doesn’t this year, there’s always next year. There are a couple of things you can do to become more active, and hopefully noticed by the right people. Have you considered signing up with MomSelect? 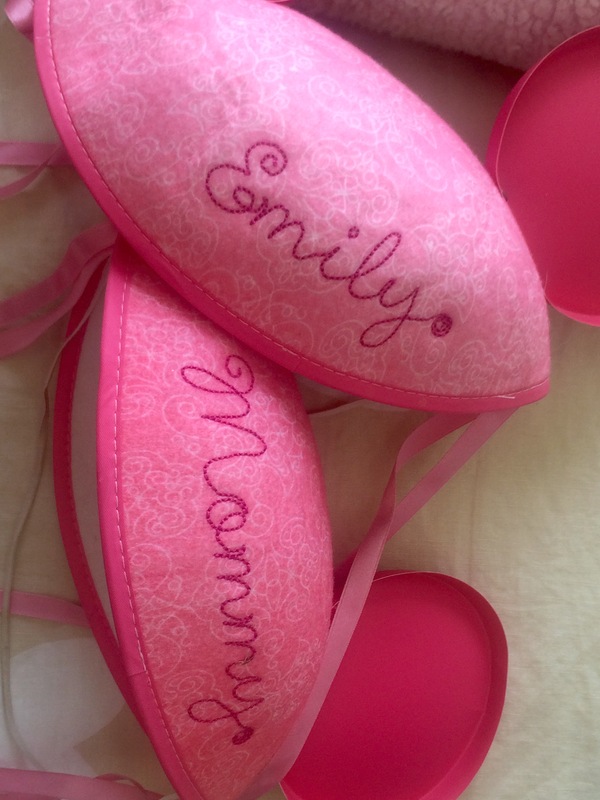 You can register as “a mom” or “a mom blogger” and there are often wonderful opportunities to do such things as throw a Disney Side at Home Celebration, which you may have seen happening online. There are also other fun opportunities too, but if you haven’t registered yourself yet, you’ll want to do so right now! Another suggestion would be to stay active on as many of the social media channels as possible! If you are only on Facebook, consider putting yourself out there more on Twitter, Instagram, Pinterest, Google +, etc. Personally, my most favorite social medias are Twitter and Instagram. 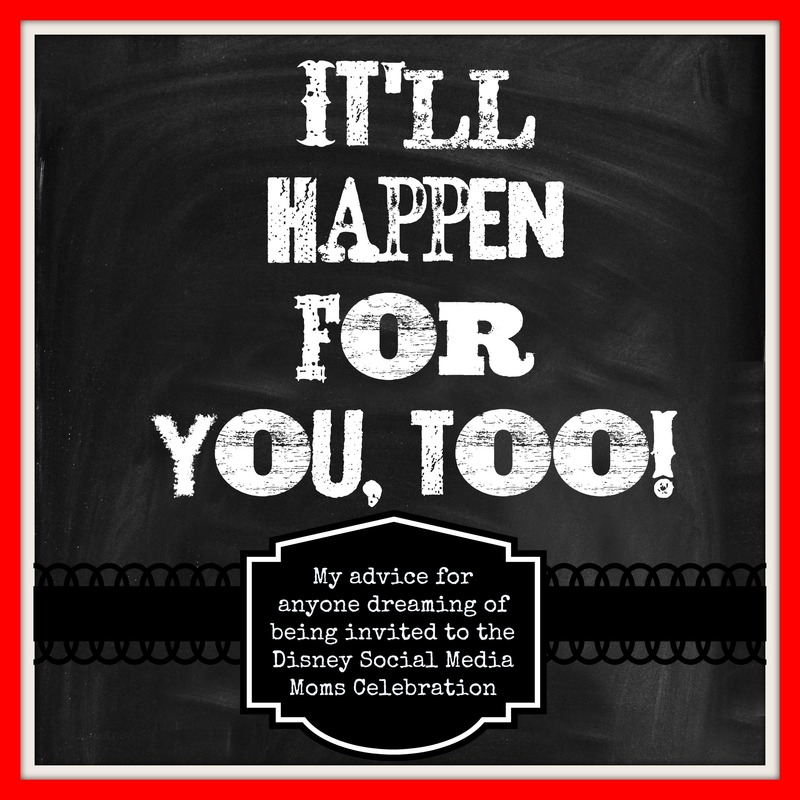 There is also a great group to join on Facebook called Disney Social Media Moms: Alumni & Hopefuls. Request to join and get to know a bunch of the other Disney Moms (and Dads). I’ve made a ton of friends this way. My last suggestion is to do something I did last year. It’s the most fun thing, too! If you didn’t (or don’t) receive an invitation to this year’s Disney Social Media Moms Celebration, then you can actually register to be invited to one of this summer’s Disney Social Media Moms “On-the-Road” Celebrations! It’s a one-day conference where you get to connect with a ton of other Disney Moms, as well as the Disney Team! This is what I did last year and it was SO much fun! I’m actually hoping to go again this summer too. As soon as the site opens up to register for the interest list, you’ll start seeing people post about it online. Then, you too can go register and then wait…and hopefully YOU’LL get an invite to join one of the locations! I attended the one in Phoenix, Arizona last year and it was a wonderful experience. I even got to meet Grumpy Cat at the conference last year! It’s a very magical experience and something a Disney Social Media Mom (or Dad) should strive to attend. I hope my suggestions are helpful ones. I still can’t contain my excitement about attending the Disney Social Media Moms Celebration this year in Florida and can’t believe I’m going to Disney World! I hope you’ll follow along online! 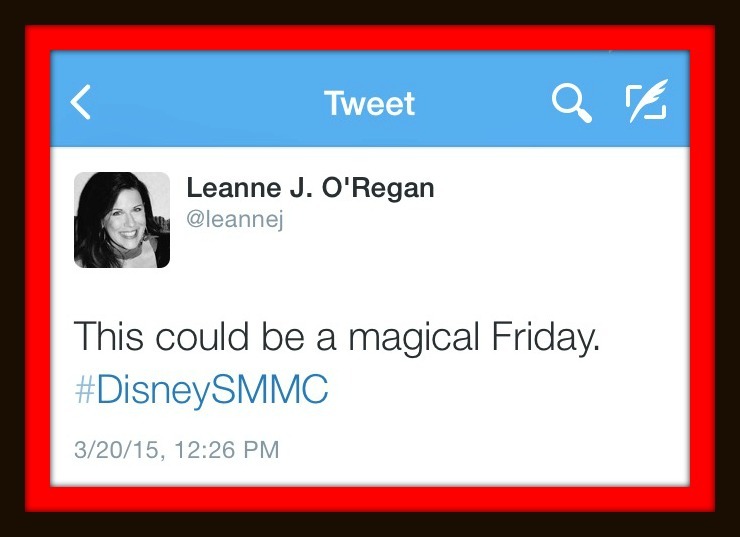 Look for the #DisneySMMC hashtag! ChEARs! Yesterday was the most “magical” Friday ever! 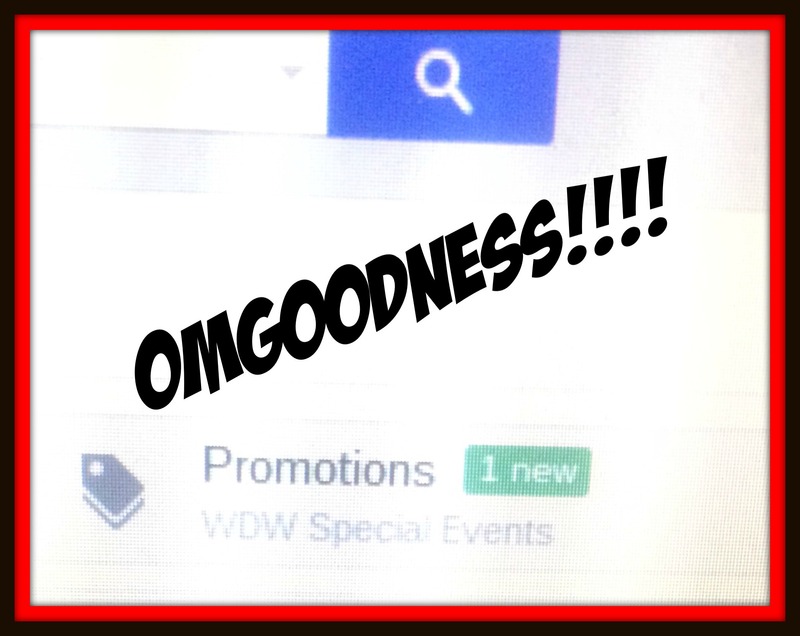 I had absolutely no idea that invitations for the Disney Social Media Moms Celebration were even going out yet. I suppose if I hadn’t been at work, teaching 29 little busy bees all day and had been online, I may have seen the tweet that practically broke Twitter…in a good way, of course! I’m kind of glad I didn’t see it though because I would’ve become an instant ball of nerves afterwards, checking my email obsessively! Instead, I finished up an exhausting day of teaching without knowing a thing, dismissed the students, and found THIS on my email front page! I think my heart skipped a beat and I honestly stood there, wanting to take in the moment before daring to click it! 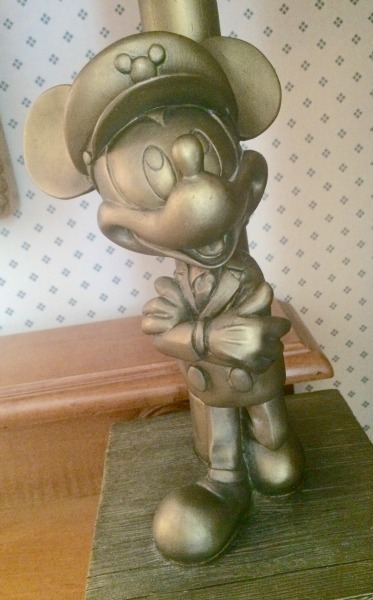 Something from “Walt Disney World Special Events”? WHOA! So, that whole “moment” I was taking before clicking it lasted about as long as it took for me to snap this picture! I swear I heard a drumroll in my head as I clicked it and BAM! There I was, jumping up and down in my classroom, all by myself! I didn’t want to post about it online until I could tell the rest of my family, but I also didn’t want any part of the Disney Team to think me ungrateful if I didn’t, especially since Twitter was going crazy with the new #DisneySMMC hashtag! However, my husband and daughter were unreachable at the moment…yep, they were on a trip with my daughter’s school and actually down in the mines, learning about The Gold Rush! What are the chances? I had to wait about 2 hours after reading my magical email to tell them! Talk about suspense! Everything worked out in the end but that sure seemed like the longest 2 hours of my life! I am so grateful for this opportunity and cannot wait to see what’s in store for us in May!